It was more of a white day for a nice wedding. My oldest son, Hayden, was married on March 24th at Donner Lake. While being married on a lake sounds like a wonderful idea, for those of you not familiar with Donner Lake, it lies smack in the middle of the inhospitable land that resulted in the tragic end of the famous Donner Party. The lake’s elevation sits at 5,936 feet in the Sierra Nevada Mountains and is shadowed by Donner Pass at 7,056 feet. It is the highest pass on I-80 from Reno to Sacramento. The happy newlyweds, Taylor and Hayden. Now, given that it is still very much winter here in the Sierra Nevada, you would think this intimate wedding ceremony would have taken place inside where it is nice and warm, safely looking out onto the wintry lake. Instead, we were outside, right at the edge of the lake, standing in the freezing, blowing snow. But, those silly kids decided that was the exact spot they wanted to be married. The beautiful bride, Taylor, was pointed toward the bluster as she stood to say her vows. So much snow was sticking to her huge eyelashes, I was afraid she wouldn’t be able to keep her eyes open much longer. 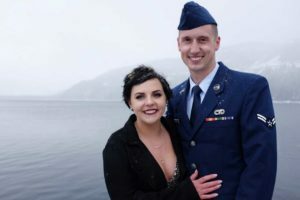 Luckily, Hayden came to the rescue, all dressed in his Air Force blues, and swapped places with Taylor, putting his face into the blowing wind. What a gentleman. The good news is that their vows were short and sweet, and after only minutes of us all standing, practically frozen into place, the famous words were uttered: “You may kiss the bride.” It nearly went off without a hitch, but just before the end, we all had a huge scare! Dzante, the officiant of the ceremony, dropped the wedding rings, and we all watched with bated breath, as they fell to the ground, inches from going over the edge with nothing but Donner Lake below. All turned out well, though. Once it was over, we quickly ran around giving them hugs and congratulations, and then ran to our cars to warm up. Right then, the snow stopped and the sun came out. Of course, it is all in the timing, but it wouldn’t have been half as much fun if the sun were out the whole time. We headed off to a delicious, warm dinner inside Moody’s in the town of Truckee, Calif. It was an enjoyable way to celebrate with close family. The following weekend, the newlyweds threw a big blowout party at Grandma’s house in Southwest Reno for the rest of the family and friends who couldn’t be at the ceremony. The weather was picture perfect, but, hey — that makes for fewer stories! A couple weeks ago, Hayden received his assignment for the Air Force. He is heading off to Yokota, Japan, and he couldn’t be happier about it. Taylor will follow in a few months when she finishes her schooling, and will bring along her three-legged dog, Bear. Hayden is the first of our four kids to get married. No grandkids yet and none on the way, either. All in due time! The newlyweds are looking forward to traveling all over Japan, and we look forward to traveling to Japan to see them soon. Congrats, Hayden and Taylor! We love you and are very proud.